UPDATE: Make sure to check out the Transbay Forest City website for many photos and videos of the Forest City/Richard Rogers proposal. The Pelli website has also been updated with a great deal more diagrams and materials than were originally posted. Not much is up yet on the Pelli website, but hopefully they’ll put more up later. So far, there’s only a larger version of this one picture, which has already been quite well-distributed. The Richard Rogers website provides many extra sketches and photographs of the Forest City design that weren’t up at City Hall, nor are they in general media circulation. Some good stuff is also up at the Skidmore, Owings & Merrill website: several nice images, and also animations. 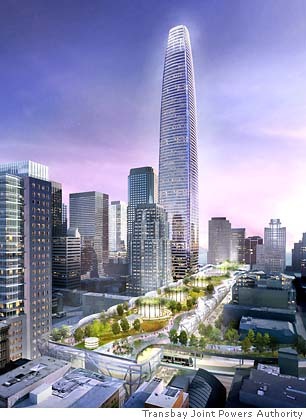 The last few posts here have been all about the Transbay Terminal redesigns, and while that will obviously be an important part of this blog, I hope to move on next to some other topics, so please check back next week!